As enjoyable and great as it can be, the running can result in the painful shin splints, which would be an injury of the Tibia’s inside border – or, in simple words, of the shin bone. Hence we have put forward an in-depth guide on the best running shoes for shin splints. Even though there isn’t exactly a single brand or type of shoes that could prevent the shin splints, there are various recommendations from runners, coaches, and the average users themselves. Alternatively, you can check out our affordable running shoes if you are on a budget. We have decided to test out all of these shoes, and check out if they’re really good for people with this condition as the users say they are. Let’s check our our collection of the best running shoes for shin splints. Brooks is a well-known company to everyone who knows a thing or two about shoes – they’re selling footwear in over 60 countries all over the world! Let’s have a look at the newest shoes from their acclaimed Ravenna series. When it comes to design, we have no complaints – the shoes are very colorful and attractive, and one can buy them in four different color combinations. There are lots of little details here, like the mesh surface which allows your feet to breathe while running or the traditional lace-up closure system on the upper side. The mesh texture also manages the moisture and offers some protection, with the insoles being made of molded foam and being completely removable. We should also mention that the collar and the tongue are very soft and plush and that the soles are made of rubber. 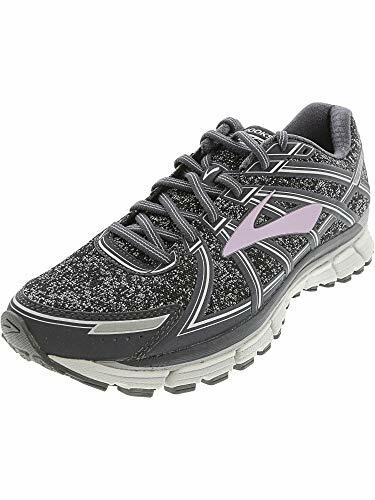 In our opinion, this footwear is great for the ladies suffering from shin splits – they are well-made and very comfortable, and come with a variety of features to make running an activity to enjoy. On the critical side, we didn’t like the high price of this footwear and the fact that the rubber soles don’t look really durable and sturdy enough. 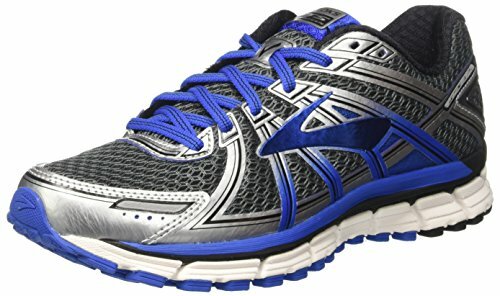 Satiate your ravenous mile munching hunger by lacing into the Brooks Ravenna 7 running shoe! This would be yet another pair of women’s shoes from Brooks, only a bit pricier and a bit more popular now. Two more reasons for us to test them out! These are very similar to Ravenna 7 shoes from the same manufacturer, featuring a similar design and the materials. On the top side of the shoes, we can notice a mesh surface (takes care of moisture and breathing) and the lace-up system, as well as the big Brooks logos on the both sides. The mid-foot saddle is asymmetrical and adjustable, creating a customizable and a secure fit for the user, which is particularly useful for the ladies suffering from the shin splits. The molded foam insoles are, of course, removable, and are there to supply the much-needed underfoot cushioning that provides the necessary comfort. There are seven different color combinations for these shoes, with our favorite being the silver/purple/blue one. 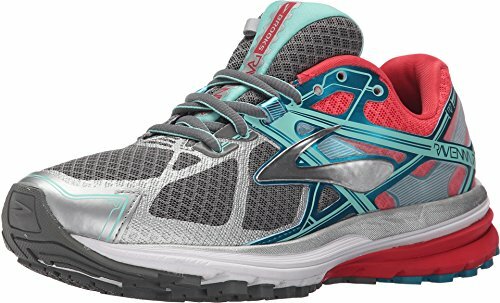 Made of breathable and flexible materials, this footwear is another good move from Brooks. We’re sure that the ladies will like them, especially those searching for some extra cushioning for their feet. Our only complaint is the lacing – it’s really cumbersome and awkward. Brooks doesn’t manufacture footwear only for the ladies – let’s have a detailed look at one of their most popular shoes for men. These are, actually, one of the nicest shoes we’ve seen so far – they feature a few well-combined shades of the blue color, and look very attractive. The upper part of the shoes has the so-called moisture wicking mesh surface, featuring some pretty durable synthetic overlays that allow the necessary breathing. The cushioning is especially great here – it’s comfy and soft, letting the user run with no adverse side effects and helping the people with shin splits. The rubber forefoot also adds some lightweight cushioning, while the midsoles come with three layers and assure a balanced and a fit ride. As the name suggests, this series has been around for seventeen years – it’s no wonder that the Brooks perfected these shoes as much as it is possible. Supportive and very well-designed, these are probably the best pair of shoes that the Brooks has manufactured so far. Almost flawless, this footwear definitely deserves our recommendation. Unfortunately, there are also some drawbacks here – we didn’t like the outsoles, as they don’t look as durable as we expected them to be. 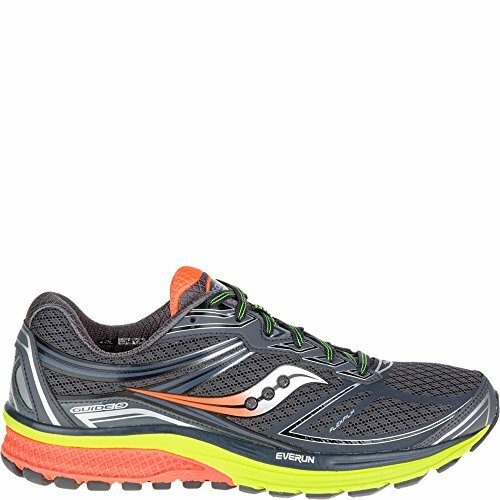 Stay on top of your stride with the perfect balance of cushioning and stability that the Brooks Adrenaline GTS 17 running shoe. Ever since Adidas launched their Boost series back in 2013, we’ve had the chance to test out several different iterations, and we liked them all. Today, we’re going to take a look at the series’ newest entry – the Ultra Boost M Running shoes. No one beats Adidas in terms of the design – their footwear always looks great, and that’s also the case here. 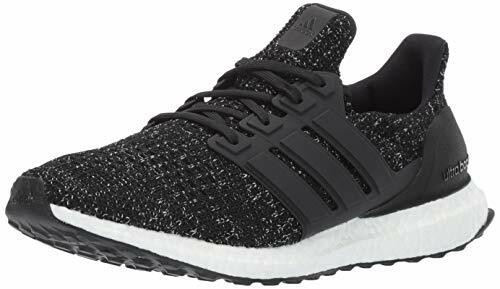 The Ultra Boost sneakers come in five different color combinations, and we simply can’t decide which pair looks the most attractive. When it comes to build quality, we can only give praises – the rubber outsole is lightweight and very elastic, with the manufacturer claiming that it adapts to the ground for additional stability. The upper part has a “featherweight” sock liner and a snug-fitting heel counter, which makes wearing these shoes a really comfortable experience. People will shin splits will wear these with joy! Once again, Adidas didn’t let us down – the Ultra Boost sneakers are among the best pieces of footwear we have reviewed so far, and we can only join the other users in their praises. These shoes are very expensive – people with shallow pockets will, unfortunately, have to look elsewhere. With over 100 years of experience, this American manufacturer of various athletic sneakers is one of the most famous in the world – their footwear is well-known for comfort and flexibility, so we simply had to check out one of their most popular models. The Men’s Guide 9 are a very pretty pair of shoes, no matter which color combination you chose (there are 8 of them). We tested the red ones (with some black and silver thrown in) and we have to say that we loved how they looked like – these are certain to catch some attention. Made of synthetic materials and combined with your usual rubber-made soles, these sneakers are pretty standard when it comes to build quality, but are also very comfortable thanks to cushioning on the insoles. People with shin splits will find these excellent, and the reasonable price is surely a big plus. If you are the person who has to do a lot of physical activity during the day and your legs are constantly moving the whole day, then you might be familiar with the concept of shin splints. Shin splints can be very painful at times, and you end up feeling exhausted. In shin splints, you feel pain in the front part of your shin, and this pain can be average to severe depending on the activity which you have done. Shin splints can cause restless legs at night, and you are not able to rest properly if you are suffering from shin splints. If you often face this problem, then you should consider buying shoes which are specifically designed for shin splints. With the advancement in technology and the growing concern of human beings about their health, we can now have specifically designed shoes for almost every problem of feet and legs. However, the question still remains about how to find the best shoes for shin splints. We have made the selection of shoes easier for you by listing out some of the must-have features in those shoes. You can look for these features while buying your shoes, and there is a bright chance you will find the best possible shoes to ease your pain of shin splints. However, always look at the features of those shoes thoroughly and then decide for yourself. An appropriate amount of cushioning and padding also provides relief from shin splints. Try to find a pair of shoes which have sufficient padding because too much padding can also cause a problem while walking. Too little padding in your shoes can cause injury, as well as the effects of running, will be absorbed by your feet. While too much padding can cause your feet to lose their stability and ill-fitting shoes can make you fall and. Therefore, you need to find a pair of shoes which have appropriate cushioning neither too little nor too much and it will provide comfort to your shins. Look for the shoes which are designed to take the stress away from your feet and those should be shock resistant and resilient to different injuries. It is best if you could find shoes with gel padding and outsoles made of quality rubber. Find the most comfortable shoes in your budget range. Pronation is the natural movement of your feet, and if your shoes are not appropriately made then, you might face overpronation or underpronation. It is also important to look for shoes which support your natural gait because it can also be one of the causes of shin splints. You should first look at your foot pronation and then find the shoes which correct pronation in your feet. Your shoes correct the pronation because it is the way your feet hit the ground and if it doesn’t hit the right way, then you are prone to injuries. Best pair of shoes will correct your pronation and provide relief from your shin splints and other types of injuries. You can also find your pronation type with the help of companies as they provide information about your pronation and then suggest shoes according to that. Always check the features of your shoes and then decide if these are best for your feet. Shoe fitting is paramount whether you are a runner, an athlete or just a regular person; you need to find a pair of shoes which perfectly fits your feet. The easiest way to get your feet injured is by wearing ill-fitted shoes as you can not only hurt your feet but also your knees, legs or even your back. Only telling size to buy a pair of shoes is not enough and you need to find the shoes which fit your toe and heels. Shoe fitting is probably the first step towards buying shoes for relief from shin splints. Find shoes which neither hurt your feet nor your legs. If you have the best-fitted shoes, there is a guarantee that these will ease the pain due to shin splints. No matter how expensive your shoes are, if they do not fit your feet properly, these are of no use. You can hurt your feet even if you have selected the best design but not properly fitted shoes. If your problem persists, you can easily have your shoe custom made by reporting it to the company. The company will look at your feet and have your custom made shoes ready. It will maximize the benefits if you have the shoes made according to your feet. Even though above-mentioned criterion is enough to make a perfect choice to buy shoes for your shin splints, you can still look at these frequently asked questions. If you are still confused about the quality of shoes for your shin splints, then you can find your answers from following frequently asked questions. These questions can also help you find a better pair of shoes for your feet which are suffering from shin splints. Take a look at these and find your answer for the best shoes. What are Shin Splints & what causes them? Shin splint is referred to the pain in the front bone of your shin which can be caused by arduous physical activity. This pain occurs both inside and outside of the shin. The pain is concentrated in the lower portion of your shin between ankle and knee. Shin splints are also known as MTSS which stands for Medial Tibial Stress Syndrome. If you are continuously engaged in a physically exhausting activity, then it creates pressure on your shin which in turn causes swelling and pain in the shin area. Shin splints can also be caused if you have any previous injury which is not healed properly. One should also give time to his legs so they can heal from the damage done by running or physical activity. You will only make it worse if you don’t give the time to heal from previous damage. Overpronation, running on an uneven surface and having flat feet are some of the most important causes of shin splints. Shin splints can be controlled using proper training and choosing appropriate shoes. However, if you don’t pay attention, it can cause fractures in your shin and other serious problems. How is Pronation linked to Shin Splints? Pronation is the natural inward rolling of one’s feet while walking. There are a few runners who are known as neutral runners experience the least amount of pronation. Other runners suffer from a higher level of pronations, and they are advised to use shoes which provide extra stability. Every one of us suffers from some degree of pronation, and it is best to find the shoes according to the pronation of your feet. You can either face neutral pronation, under pornation or overpronation. Shin splints are mostly found in people who are over-pronator, and if you suffer from overpronation, then you should find shoes which are mostly on the inside of the sole. An underpronator needs to wear most on the outside sole. Finding your type of pronation helps you find the appropriate shoes and relieve the shin splints exultantly. What are the natural remedies to prevent Shin Splints? You can elevate your legs and put ice packs, so the swelling is reduced on your legs. You can also use some anti-inflammatory drugs to reduce the inflammation. Bandages and compression socks are also helpful in combating pain and reducing swelling. You can also massage your shin and calf by hands or foam roller. Try to do light exercise and cut the heavy exercise and physical activity. Try to do exercises which do not need much use of feet like swimming or walking which do not put a strain on your feet. These remedies are only for light relief, and you need to take it seriously if you don’t recover from shin splint if it keeps occurring repeatedly. If you suffer from Shin Splints what are the other exercises besides running? Any light exercise which suits you is recommended for shin splints including walking; swimming, cycling, or use of elliptical can reduce the effects of shin splints. Don’t rush into it because you can ruin your leg if you ignore these shin splints. These exercises might give you results late, but heavy exercises are not worth ruining your legs. Stretching every muscle in your legs, tracing the alphabets with your legs on the floor and alternate walking on your heels are some of the most recommended exercises for shin splints. Attractive and comfy, these sneakers are one of Saucony’s best yet. Even though they’re not flawless, they have a lot of good things going for them, and we have to recommend them. The biggest problem with these shoes is their low sturdiness – we didn’t test them for long enough to see it for ourselves, but some users all reporting all sorts of durability problems. We hope that you liked our recommended list of the best shoes for shin splints for men & women.